For optimum echo-cancelled voice quality and enhancement choose the A200D Model with DSP daughterboard Hardware Echo Canceller. One DSP echo canceller on the A200D Base Card will support Telco-grade hardwareecho cancellation on all channels up to the card’s maximum configuration in 24 ports with no additional CPU load. To reach this configuration, simply add additional Remora™ cards to any base card in the A200 Series. 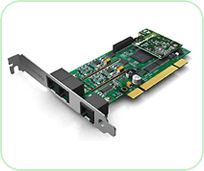 A singlePCI or PCI Express slot hosts the connection and ensures common synchronous clocking for all channels. Like all the cards in the award-winning Sangoma AFT Series Product Line, the A200 and Remora™ system’s architecture is shared with Sangoma’s A101, A102, A104, and A108 cards, ensuring common 3.3 V or 5 V, high performance, universal PCI or PCI Express compatibility, and crash-proof field upgradable firmware to take advantage of enhancements, as soon they become available. 1 port of FXS and 4 ports of FXO. Introductory series optimized for small-budget installations. With B-Series hardware, Sangoma’s premium audio and engineering quality is even more affordable. For small, stable systems, when the modular design, single-slot expansion and port-customization power of Sangoma’s A200 and A400 series is not required. The Sangoma B600 voice cards deliver customers a substantial cost savings, coupled with the “because it must work” quality and the Wanpipe® high-end system diagnostics, drivers, and utilities for which Sangoma is known worldwide. Your customers can achieve optimum echo-cancelled voice quality and enhancement by choosing models withTelco-Grade DSP Hardware Echo Cancellation. One DSP echo canceller on the B600D or B600DE voice card provides Telco-grade hardware echo cancellation on all channels with no additional CPU load and minimal additional cost. The A400 Series of analog voice cards deliver superior audio quality in a 2U card that expands from two to twenty-four ports using a single interface slot. For optimum echo-cancelled voice quality and enhancement, choose the A400D Model with DSP Daughterboard Hardware Echo Canceller. One DSP echo canceller on the A400D Base Card will support Telco-grade hardware echo cancellation on all channels, up to the card’s maximum configuration in 24 ports with no additional CPU load. To reach this configuration, simply add additional Remora™ cards to any base card in the A400 Series. 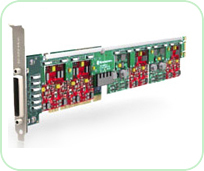 A singlePCI or PCI Express slot hosts the connection and ensures common synchronous clocking for all channels. 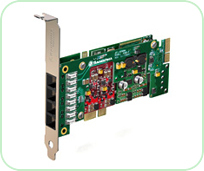 Like all the cards in the award-winning Sangoma AFT Series Product Line, the A400 and Remora™ system’s architecture is shared with Sangoma’s A101, A102, A104, A108 and A200 cards, ensuring common 3.3 V or 5 V, high performance, universal PCI or PCI Express compatibility, and crash-proof field upgradable firmware to take advantage of enhancements, as they become available. Sangoma’s USB fxo is a low-cost development tool kit, ideal for those just getting started with Asterisk® or those who just want a simple external solution. 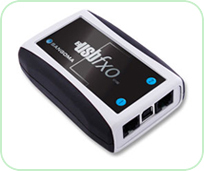 The USB fxo is easy to install. There is no need to open up the computer to insert an interface card. Simply plug it in, and set up your Asterisk system; configure Sangoma’s Wanpipe® drivers, as you would with any Sangoma card, and you’re set to go. You can even connect multiple USB fxos in one system.